The answer to this question is…. In most states, lockpicks and related tools are completely legal to own and carry, but can be used as evidence against the carrier if they end up accused of a crime. Whether or not it is up to the state to prove that you intended to use those tools for evil differs from state to state. Lockwiki maintains a handy chart of the legal status in all 50 states and several countries (Disclaimer: LockEx does not keep track of and verify whether this chart is up to date). Be sure to pay special attention to these laws if you live in Nevada, Mississippi, Virginia or Ohio. For residents of other states a little common sense goes a long way. 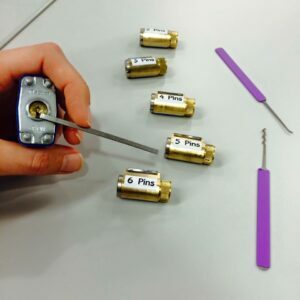 First of all, the golden rules of lockpicking are not just guidelines; they’re an important part of the locksport ethos. Don’t pick a lock that you don’t own or have express permission to pick. Don’t pick a lock that you rely on. With basic common sense and an understanding of your local laws, locksport can be incredibly fun and challenging. Get out there and join the community; it is full of people that are ready to share their knowledge.